The year 1959 is considered by many to have been the most influential year in the history of jazz, the most creative, the year that changed the music forever. It was the year Miles Davis recorded Kind of Blue, Dave Brubeck Time Out, Ornette Coleman The Shape of Jazz to Come and Charles Mingus Mingus Ah Um. While the Davis and Brubeck contributions may be considered cerebral expressions of the music, and Coleman’s an entirely new one, the Mingus album was very much an expression of the music’s roots. Described in the Penguin Guide to Jazz on CD as “an extended tribute to ancestors,” the album honors musical forebears that included the gospel singers and preachers Charles Mingus grew up hearing in the Watts section of Los Angeles, and giants of jazz Jelly Roll Morton, Lester Young, Duke Ellington and Sonny Rollins. But it is no less an expression of the virtuoso bassist, accomplished pianist, bandleader and composer Charles Mingus himself. Growing up in Los Angeles, Mingus played professionally with band leaders Louis Armstrong and Kid Ory in the early 1940s and, later, played with the Lionel Hampton band and toured with vibist Red Norvo’s trio. In the early ’50s, he moved to New York City, where he soon established himself, playing and recording with legendary musicians Charlie Parker, Miles Davis, Bud Powell, Art Tatum and Duke Ellington. And it wasn’t long before he was leading his own groups, a rarity for a bassist. As a soloist, composer and bandleader, Mingus drew, as noted, from many sources, but the greatest of his influences, as he duly notes, was clearly Duke Ellington. The late Gunther Schuller observed that, like Ellington, Mingus should be ranked among the most important American composers, jazz or otherwise. And like those of his predecessor, Mingus’s ensembles reflected their leader’s appreciation of the unique style and special contribution of each of their members. But Mingus’s music was a more rough-and-tumble expression of the music than Ellington’s, favoring collective improvisation in the way of early New Orleans bands, and with Mingus, behind his bass, shouting, exhorting his players, urging them on. Mingus was known equally for his temperament, earning him the sobriquet “the angry man of jazz.” In fact, the man was long plagued with mental illness, including deep, clinical depression, a condition that not infrequently expressed itself in onstage eruptions, violent confrontations and impulsive firings. 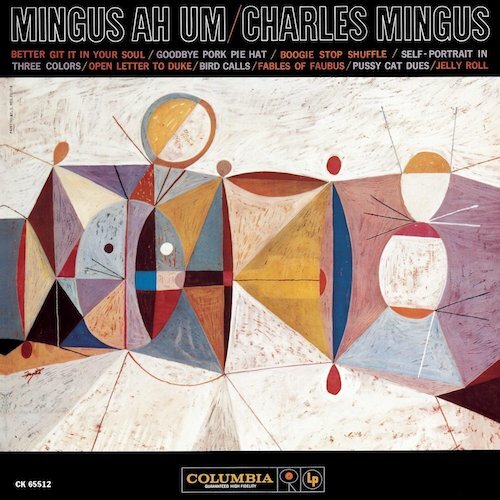 It can all be heard in Mingus Ah Um—the influences, the anger, the genius. “He swings and shouts and hollers and somersaults,” says one reviewer of the album. Its playlist jumps moods, now evoking sadness, now joy, now poignancy, now outrage. It’s Charles Mingus’s soap box, as he mocks the white supremacist Governor Orval Faubus of Arkansas. Of course, it too is a showcase for one of jazz’s enormous talents, one of a handful of the greatest albums produced in the year that just might have been the most important one in the history of our music.